Puritan’s Pride has provided me with free product and has sponsored this post, the opinions expressed are all mine and mine alone. I have to thank Money Saving Parent and Puritan's Pride for this wonderful opportunity to review Puritan's Pride vitamins. My immune system has been crap lately. I've just been run down, and the constant change in weather isn't helping. I don't care what people say, the change in weather always has an affect on how I feel, and my immune system. In addition, now I have started working as a substitute teacher. So, you know that means that I am around loads and loads of germs. I truly believe in the use of vitamins. I used to be pretty skeptical until I got fibromyalgia. One of my doctors started me on several vitamins to take in addition to my medicine. It really has done wonders for me. I have more energy, and pain doesn't get as bad as it used to before I started taking my vitamins faithfully. Vitamins like Puritan's Pride, always seems to boost my immune system. The other day I had that itchy feeling in the back of my throat and my ears were bothering. I got my new vitamins in that same day, Astragalus, Vitamin C & Elderberry; Maitake Mushroom Complex; Echinacea with Goldenseal Root; Elederberry Sambucus; and Astragalus Extract. I was a little worried because it is about that time of year when I get bronchitis, and this is how it usually starts. I started taking the vitamins as soon as I got them. Within a couple of days all of my symptoms were gone. I can't say for sure it was the vitamins but I am pretty sure they helped. 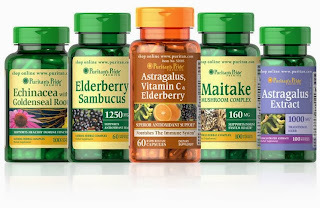 Puritan’s Pride® (www.puritan.com) began over 40 years ago, with the mission of making the finest quality nutritional supplements available at the best value to their customers. Today, the company remains true to its original commitment and serves millions of loyal customers. Puritan’s Pride manufactures thousands of vitamins, minerals, herbs and other nutritional supplements in their state-of-the art facilities located throughout the U.S. As part of the company’s commitment to quality, Puritan’s Pride only uses ingredients from suppliers worldwide that meet their Quality Assurance Standards, as well as Good Manufacturing Practices food quality standards. What are some of the health benefits of Echinacea with Goldenseal Root? Echinacea is one of the world’s leading herbs for immune system support, while Goldenseal has a long history of traditional use. * Goldenseal contains alkaloids, including hydrastine and berberine. Elderberry naturally contains beneficial flavonoids, including plant-based phytochemicals with antioxidant properties. * Elderberries also have a long history of use as a food. How does the combination of Astagalus, Vitamin C & Elderberry work together? The dietary supplement of Astragals, Vitamin C & Elderberry combines one important immune system vitamin with two traditional herbs. * The result is a unique immune health supplement with antioxidant support. * Vitamin C is one of the leading vitamins for immune support. * Astragals and Elderberry naturally contain phytonutrients. DISCLAIMER * These statements have not been evaluated by the Food and Drug Administration. These products are not intended to diagnose, treat, cure or prevent any disease. If you are looking for some great vitamins, you need to try Puritan's Pride. You can even get a discount right now. Puritan's Pride is offering 20% off of a $25 purchase (any brand0 and free shipping with the discount code IMMUNCP. This is good through 1/15/2014. While you are at it, you might want to check out the Puritan's Pride Facebook page, and Twitter page. I have started trying some of these type products recently and I would love to try more!